Specifications	Article Nr. 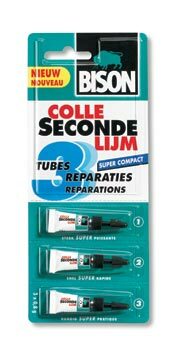 6301451 -12 Description Bison Secondelijm Super Compact Card 3 x 0,8 g NL/FR Model BS-235 Brand Bison Product description Catalogue Extra fast and strong super glue - portioned in 1g tubes, in the handy storage box. Ideal quality for each application - 3x originally sealed tubes. Due to its consisteny the super glue reaches smallest corners and joints. Description - Sales sheet Bison Secondelijm MINIS Compact 3 x 0,8g Liquid Blister Field of Application - Sales sheet Ideal for small-area bonds (not suitable for large-area bonds). Glues many plastics, metals, porcelain, ceramics, rubber and wood. Only partly suitable for glass (over a period of time the bond becomes brittle, causing it to weaken). Product description - Adhesive computer Extra fast and strong super glue - portioned in 1g tubes, in the handy storage box. Ideal quality for each application - 3x originally sealed tubes. Due to its consisteny the super glue reaches smallest corners and joints.